Enhancing the "image" of your next gig, event or promotion will be a snap with the new Ikon LED from ADJ. This high-output gobo projector is powered by a bright 60-watt 7,500°K white LED and features exceptional optical quality, allowing it to produce impressively bright, crisp images and patterns on walls, floors, ceilings and other room surfaces. Housed in a lightweight 8-lb. (3.6kg) case, the Ikon LED is ideal for mobile entertainers, weddings, nightclubs, corporate events, retail stores, trade show displays and promotions of all types. The versatile projector will add excitement, professionalism, and a personalized touch wherever it’s used. 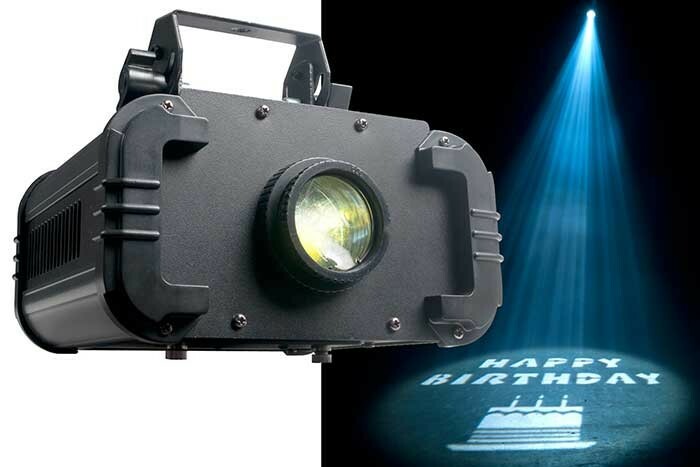 It comes equipped with four replaceable metal gobos with universal salutations, such as "Happy Birthday" and "Congratulations," but users can easily substitute their own customized gobos, displaying, for example, a corporate logo, the names of a bride and groom, or a promotional message. This made-to-order image can then be inserted into the projector via its Easy Gobo Replacement Access feature. The Ikon LED also provides a lot of flexibility in terms of multiple beam angle options. It comes with three interchangeable lenses for producing 25°, 32° or 43° beam angles, allowing it to adapt to a variety of design needs and applications. Other features that add to the unit’s versatility are adjustable dimming and gobo rotation. Users can easily increase or decrease LED brightness, and speed up or slow down rotation speed, via convenient knobs on the real panel. Additionally, the Ikon LED comes with an ADJ RF Wireless Remote Control that gives operators command over dimming, rotation and other functions. The inclusion of a wireless remote is one of the projector’s many value-added features, pointed out Alfred Gonzales, national sales manager for ADJ. 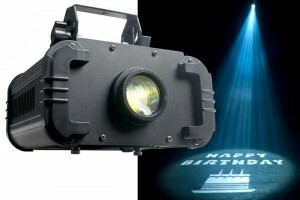 "The Ikon LED is a full-featured, high-quality gobo projector in a very compact, lightweight case," said Gonzales. "Its powerful 60-watt white LED source and excellent optics produce clear, sharp, professional-looking images. And it comes with many added features, such as a wireless remote control, 3 lenses and 4 replaceable gobos, which give it a lot of versatility and value – making it a great investment for any lighting tool chest." With its long-life LED lamp rated at approximately 50,000 hours, the Ikon LED won’t burn a hole through your wallet when it comes to maintenance costs. It is also very energy efficient and cool operating, and it can run all night without duty cycles. The unit features multi-voltage operation --100V-240V, 50/60 Hz – and an IE AC outlet on the side to daisy chain power for up to 4 Ikon LEDs @ 120V, and 7 Ikon LEDs @ 240V. It also includes a yoke for mounting on the wall or hanging from trussing. Compact in size, the Ikon LED measures 9.5"L x 8"W x 8.5"H (236 x 227 x 215 mm), and weighs 8 lbs. (3.6 kg.). Gobo size is 54 mm, with 33 mm viewable.